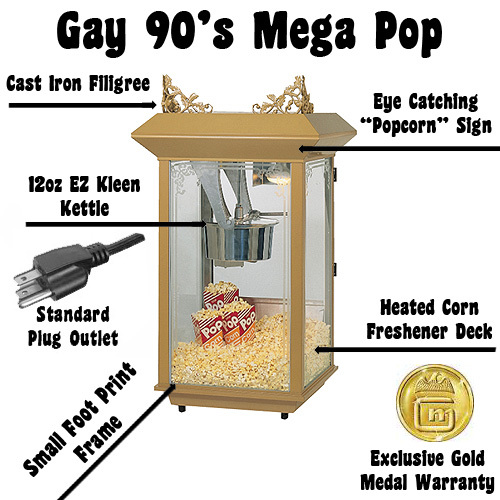 Gold Medal's 2213 Whiz Bang Gay 90's 12oz/14oz popcorn machine offers a small footprint than most large poppers. 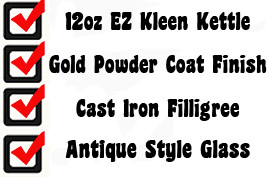 Check out the etched windows, gold paint, and the cast iron filligree that adorns this top quality popcorn popper. The 12/14oz EZ Kleen kettle will pop up to 250-1oz servings per hour and the heated popcorn deck will keep the fresh popped popcorn warm. The heavy duty aluminum cabinet, heated corn freshener deck, and twin rocker arms, make the Gold Medal Red Top 2213 Whiz Bang Gay 90's 12/14oz a super great popcorn machine choice. Popper dimensions-28" W x 20-1/4" D x 44"